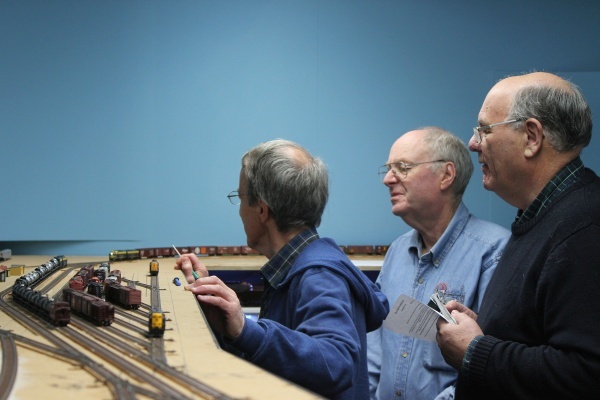 Today the GC&SF hosted its first operating session since January 2014. 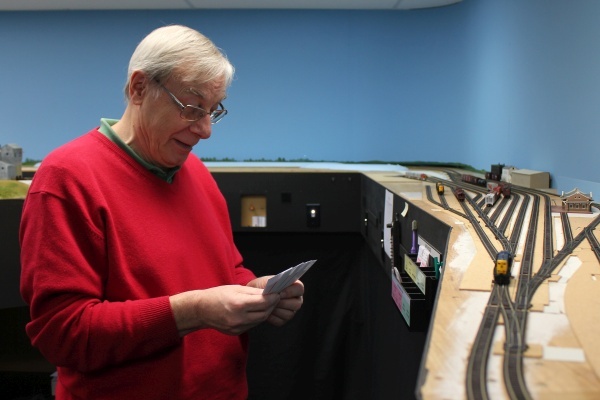 The session was intended to test the layout's readiness to host a 'serious' session, and I expected it to disclose any problems that may have crept in during the two years the layout has been dormant. As several of the guest operators had never seen, much less operated on the GC, I set the fast-time clock to 4:1 ratio instead of the usual 6:1. We used the timetable that I presented here. I'm pleased (and proud) to report that apart from a minor glitch with a couple of radio throttles, everything went very well. Everything except my photography, that is. For some reason, I had depth-of-field problems with many of the photos that I took. I'll have to check my camera settings. The following photos are the best of those that I took. 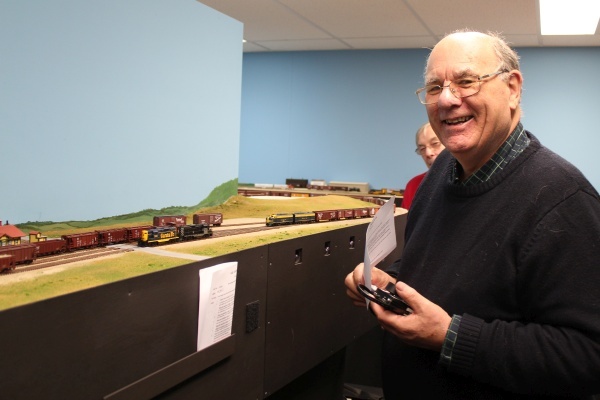 John F was press-ganged into serving as the Ardmore yard operator. Thanks John. 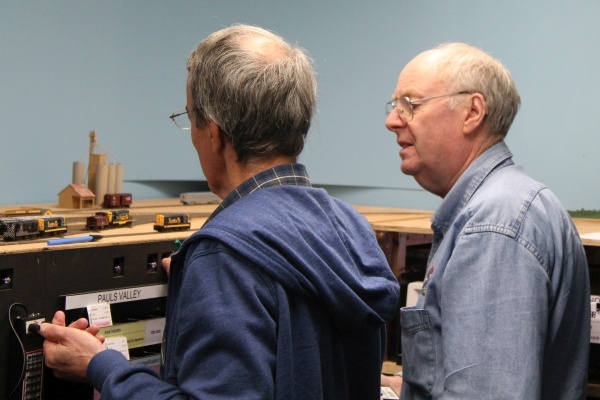 Graham, also a first time operator on the GC&SF, ran the Pauls Valley local. I'm not sure where the train is. 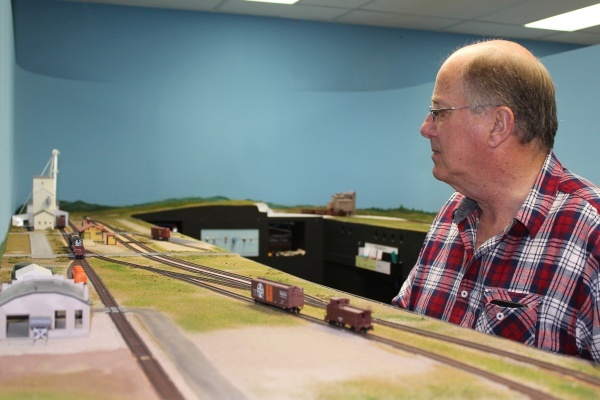 It's a busy time at Pauls Valley as a tank-car train driven by Bill holds on the main track for Peter's through-freight to arrive. Meanwhile, over at Dougherty, Rod is almost ready to return to Ardmore and Gainesville. 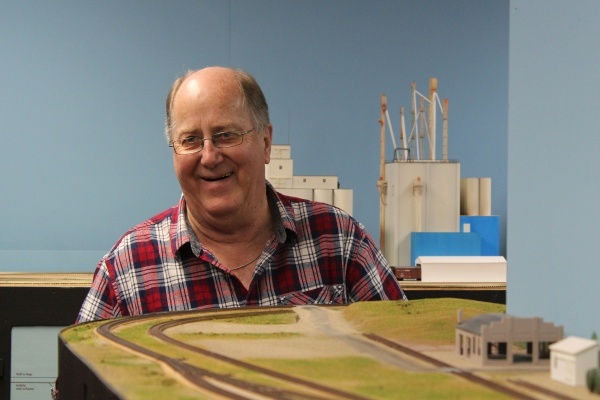 Having switched some cars at the Kerr-McGee refinery in Wynnewood, Bill has been waiting on the main at Ardmore for the northbound Texas Chief (driven by Peter) to arrive. 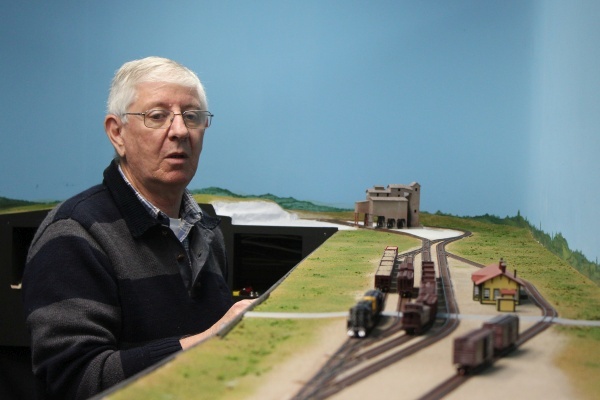 The Pauls Valley local has returned to Davis, and Graham has just finished switching the cars he brought back. 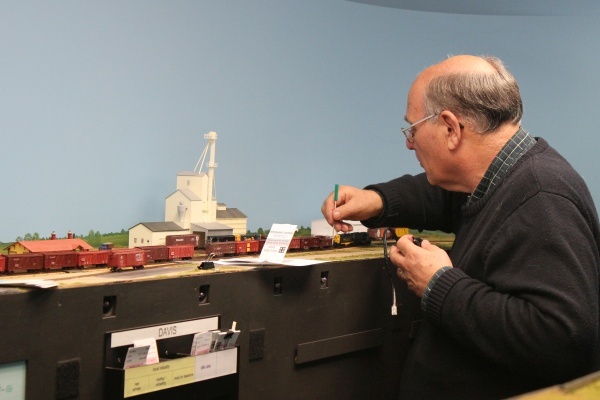 Peter again, this time with the Livestock extra, which brings a bunch of stock cars up from Texas for loading at Davis and Pauls Valley. Thanks for coming over guys. I had a great day, and I hope you did as well. I think it was one of the best sessions I've had on the layout. Hi Gordon! Great to hear from you. That's my Texas Chief. It has a LL A6A/B set (both powered) plus 11 cars (from memory). From the photos I've seen the B unit should probably be an E8B, but I haven't been able to get a LL E8B body to go on my mech. I'd like to make my pass trains match the prototype consists as closely as I can using RTR cars, but I think I'll have to build up some cars using etched carsides. You have a fantastic layout! 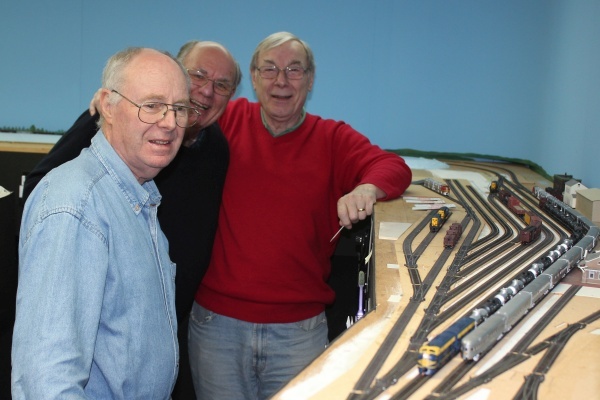 It looks like the operating session was a great deal of fun. I just rode a part of these tracks recently on Amtrak's Heartland Flyer on my way home from leave. It truly is beautiful country! Thanks Alex. Yes, we do have a lot of fun. And I'm hoping to make that trip myself, someday.